Iris and I were chatting the other day about magical tools. We both like to haunt thrift shops and secondhand bookstores, so many of our magical tools have histories. We’ve got stones, books, cards, jewelry, and many other things used for mundane and magical purposes. Feng Shui tends to frown upon secondhand items, and many magical folks won’t use tools that have belonged to other practitioners. Granted, sometimes things can come with negative histories – whether they’re teacups or Tarot cards. But there’s no need to fear the secondhand! Re-using and re-purposing all manner of magical stuff is good for the environment and the wallet. 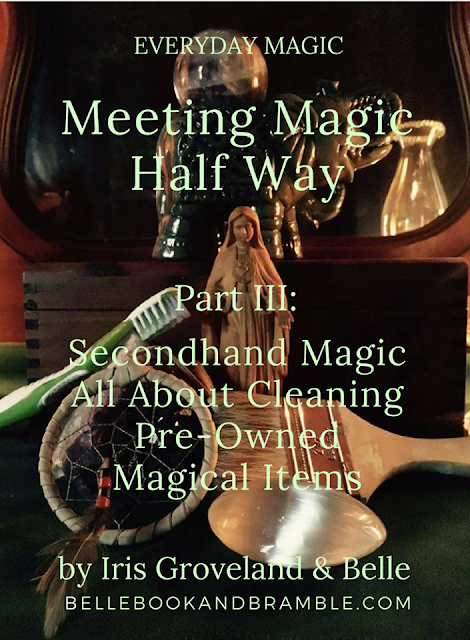 Iris and I are here to share our tips and tricks for cleaning magical tools to give them a fresh start. Belle: I tend to accumulate a lot of books and Tarot cards, magical and otherwise. For used paper items like this, I give them a good dusting with salt and blow it away outside. Passing particularly energy-sticky books and cards through some incense or sage smoke also works. For books that are a little stinky, popping them in the freezer for a week or so seems to help, followed by spreading open the book in sunshine for an afternoon outdoors. I’m sure my nosy neighbors are quite intrigued by my reading material, but that works for me! Whenever I get a new deck of cards, I also envision the deck in a bubble of white light from the Goddess, introduce myself, and ask for their assistance as I work. Iris: The first used deck I ever received was such a mixed bag. On one hand, the deck felt dirty. It was just a Rider Waite deck that clearly had a lot of miles on it, and there’s something about that which I quietly respect. I didn’t touch them for years, and I’ve still never done a reading with them. And the only times they came out were as a prop for live action role-playing. I kept them wrapped in a dish towel I had tie-dyed once upon a time, so at least they were wrapped in something bright and cheery. But I never could bring myself to get rid of them and I’ve had them for probably 20 years. I still may never use them for reading, but I felt that they were simply now mine. I honestly feel here that an item will carry the energy you allow it to, and that we need to remember our own energy, our own intent and will, and take control over those feelings of ookiness. They live in the same drawer as all my other decks, and while I’ve never formally cleansed them, I just feel they’re OK now. Squatter’s rights, I suppose. They mean something to me as a piece of sentiment, and that has a lovely power on its own. Belle: That’s a really good point about keeping cards in a bag or cloth to keep them happy. One of my good friends made me a lovely quilted bag that my go-to deck lives in. Most of my other decks seem to wind up living in scarves or cigar boxes. So many decks wind up smelling like tobacco! How about stones? For magical stones, I do a quick internet search to see if the stone I want to clean is water or salt-friendly. I learned that lesson the hard way – I soaked a beautiful selenite egg in salt water overnight and ruined the shiny finish. For most ordinary stones, like quartz, a good soak in salt water cleans most of the gunk out and makes them sparkly fresh again. I feel that stones are endlessly programmable. They’re far older than any human who has ever held them, and saltwater, rainwater, or even burying them in the ground for a little while leaches any stuck or negative energy in them. Iris: Oh yeah, check the water solubility first! And I agree with you; stones are tough. They sat in the raw earth for hundreds of thousands of years, withstanding all kinds of temperature and environmental changes and catastrophes. A little soap and water is not going to hurt them (unless it will in certain cases). Here, my trusty tools are simply an old toothbrush (a house cleaning necessity in any case) and soap and water (usually dish soap). They all go to the kitchen sink and get a good scrub. The toothbrush and soap are especially helpful with the raw stones, whose jagged edges are dust magnets. I like doing this on a nice, sunny day (usually one of the first as spring is emerging) or sometimes, I’ve done it on a rainy day. After everyone is spit polished, I set them outside to dry. In my apartment, I was lucky to have a little balcony they could sit on without being disturbed, but a sunny windowsill where they might not be an option will suffice, unless you have cats who like to knock things over, then you might need to improvise. To me, the sunshine itself does more of a thorough cleansing and blessing than I could do. They just feel better afterward. On a rainy day, I feel like the natural rain water is a also a blessing on its own. What could be a better rinse than that? Any natural water is going to pack just as much punch as I could. Belle: Yesss! Natural water is amazing. I keep a rain barrel for such purposes. I am really hoping someday to have property with a creek or stream, because that would be all kinds of handy! I’d probably be grabbing some of it to do magical laundry. Speaking of which, I picked up a wonderful cape at a thrift store last year. I put it in the washing machine on the delicate cycle and put a bit of salt in with the cold water (spot-testing it first, of course). I sometimes feel like this is cheating in terms of clearing, but it seems to work. Similarly, I consider any stones that have gone through a cold wash cycle in my jeans pockets to be thoroughly cleansed. Because I’m lazy like that. Iris: Same here! Work smarter, not harder! I use essential oils a lot in laundry anyway, and a little can go a long way toward not only making things smell good, adding extra bacteria-killing power, but putting the smack down on any bad energy that may have snuck in there. This can go for second hand goodies as well as something like your work clothes. Maybe it was just a day where you had people that were constantly assaulting even your stoutest protections and you just want to take the extra step. A few drops of sage oil in the rinse cycle and we’re done. I love the idea of cheating with a pinch of salt in lieu of oils, though. It’s not just for dinner, folks! Also, I feel that the ability to line dry clothing is also a big thing here. To me, there is nothing that is going to clear something out better than Nature’s own handiwork. Some sunshine and a nice breeze will make anything feel fresh and new, no matter how it came to you. Often, because I am also lazy, things get left on the line in the rain, and that’s OK, too. Line drying is not only a great environmental alternative; it’s actually easier on your clothes or other textiles in the long run, and a little extra rinse can add a nice natural freshness on all levels. Belle: Oooh, I love that! I have some wool dryer balls that I keep forgetting to use oil with. And I agree with you about line-drying. I swear, sunshine has a smell. There’s nothing that improves my sleep more than sun-dried sheets. Iris: Sun dried sheets are the best. There is nothing like them at the end of the day. Belle: What do you think about cleaning statuary and other fragile bits and bobs? I have a really lovely polymer clay statue of Bast on my altar. I dust it, but have a hard time figuring out how to clean it, because it’s so darn fragile. For things that are glass, I often cheat and use the dishwasher. I put glass candleholders (which are often mason jars for me) into the freezer first to pop off all the crudded-on wax and send ‘em through the dishwasher with a handful of salt and a bit of vinegar in the rinse-aid reservoir. Iris: I love a fat, dry paint brush for cleaning the more fragile items that maybe can’t take any soap or water or even dusting polish. It gets the dust off without scratching any delicate paints or finishes, it gets in all the crack and crevices, and while this may sound like the pinnacle of laziness, I find it gives you a little one-on-one time with the object at hand. Because you have to pay attention to what you’re doing, you get tricked into a mindfulness exercise and I find myself talking to the object at hand, sort of checking in with how it’s feeling. It’s a wonderful time to focus your intent without any grand set up. I have a carved wooden Mother Mary figure from the Black Forest region in Germany and she’s just a treasure (she’s my Goddess stand-in a la The Mists of Avalon). This is a great time to say “thank you” for the gifts that object brings you as you give them a little refreshing bath. My dreamcatchers are another group of items that require physical cleaning as well as cleansing and here again, the paint brush is my best friend. It’s gentle enough to get the dust off of the webbing and maybe even off any feathers, beads, yarn or other soft ornamentation. I love to hang them outside for a time, again, on a nice sunny or breezy day (No rain this time! Don’t want to get them wet!). Just like we talked about in making sure you give negative energy somewhere to go by opening a door or window, I like to clean my dream catchers outside. Obviously, the dust gets blown away and doesn’t just resettle elsewhere, but again, the wind and the sun and the collective spirit of Nature gets a chance to clean out that webbing on an energetic level better than I could. Our tools work hard for us, and just like fishermen need to tend to their nets, I feel like giving my dream catcher webbing a breath of fresh air in lieu of my bad dreams is my way of saying thank you. I mean, I have to clean my coffee pot now and again, too, in order to keep it working properly. 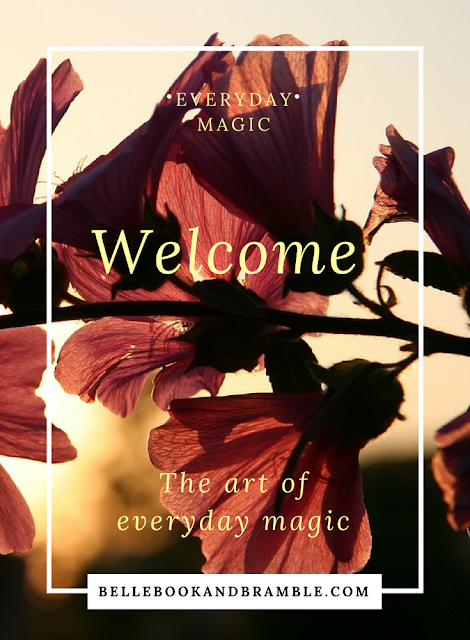 Why should my magical tools be any different? Belle: Those are wonderful ideas. And I love the idea of taking time to thank our tools properly. Thank you so much for coming by to chat with me today! I really appreciate your advice in this area! Readers…do you have any tips or tricks for cleaning your magical gear? Anything that’s particularly easy or difficult to clean? If so, let us know! I love used items. I always hot up garage sales and flea markets for treasures. I usually "feel" the energy to make sure nothing negative is hanging around. Thanks for the tips on cleansing them. I've had that on my mind lately and this will push me to be more vigilant about not bringing in someone elses baggage. I love the used stuff, too! Summer weekends are my favorite time to do "garage sailing." I only got some really stinky baggage one time...literally. I was looking to furnish a new place several years ago, and found a glass and metal coffee table and end table set at a garage sale. My mom and I stuffed them in the back of the car, and the lady who was selling them was worried about the glass breaking. So she rushed into her house to find something to pad them with...a handful of dirty men's and kids socks. My mom and I got a half block down the road before we made faces at each other...these were THE STINKIEST SOCKS in history. It was an AWFUL trip back home, even with the windows rolled down. Those socks stunk up the outside trash can, even.